Sorry, we are having problems uploading songs from the CDs we'd planned to promote. So, we are skipping the CD promotions this week. 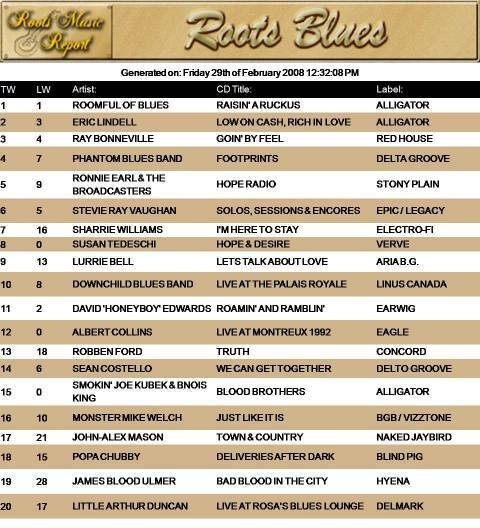 Blues Music Award voting has been extended until Monday March 3, 2008. Voting will end at 8:00 am central time. All members of the Blues Foundation are eligible to vote. The 29th Blues Music Awards will be Thursday May 8 at the Grand Casino and Hotel in Tunica, Mississippi. Many nominees will be performing in Tunica and Clarksdale before and after the Awards and tours will be available to visit all the blues historical sites in the Delta, including the new Mississippi Blues Marker Trail, developed by 2008 Blues Music Awards sponsor, the Mississippi Development Authority, Division of Tourism, and the Mississippi Blues Commission. The host hotel for the 2008 Blues Music Awards will be the Veranda, part of the Grand Casino Resort, in Tunica, MS. Special $79.00 guest rates apply to those attending the 2008 Blues Music Awards. 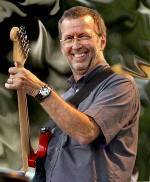 Eric Clapton has been invited to perform in the secretive state of North Korea. Rock and pop have been banned in the world's most isolated state because of fears over western influences. But the legendary English singer and guitarist, 62, has been asked to perform in the capital Pyongyang next year, according to the Financial Times. Diplomats believe the overture shows that the communist state wants to build cultural bridges with the West, even though discussions over its nuclear programmes have stalled. Clapton, whose hits include Cocaine, Layla, and Tears in Heaven, has agreed in principle to the idea, according to the newspaper. The request comes as the New York Philharmonic performs in Pyongyang following a request from the country's officials. The Philharmonic is the first major US cultural group to perform in North Korea, which US President George Bush classed as part of the "axis of evil". The North Korean State Symphony Orchestra plans to perform in London this summer as part of the orchestra's biggest ever tour, and Clapton has been invited to the country in return. A North Korean official told the Financial Times: "We want our music to be understood by the western world and we want our people to understand western music." He was inducted into the Rock and Roll Hall of Fame for an unprecedented three times as a band member in The Yardbirds and Cream and as a soloist. 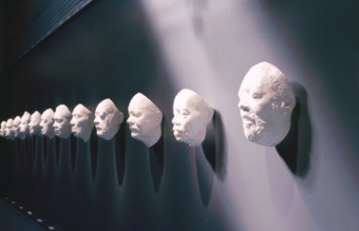 CLEVELAND, MS — Delta State University and the Charles Capps Archives and Museum are the recent recipients of a generous gift of a new blues exhibit entitled “A Cast of Blues” by sculptor Sharon McConnell of Como,MS and formerly Santa Fe, New Mexico. The exhibit will open with a reception on Saturday, March 1, from 5:30 p.m.-7:30 p.m. in the North lobby alcove of Ewing Hall on the campus and will remain on permanent display at the same location. 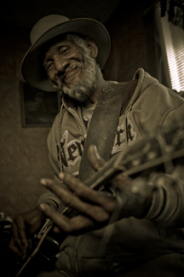 Music will be provided by “Blind Mississippi” Morris, whose face is included in the collection. Sharon McConnell, creator of the collection, will dedicate it during the reception. 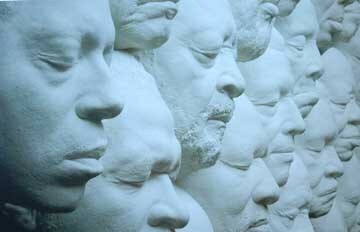 This donation includes almost 60 life masks of bluesmen, each cast directly from the face of the living person. Blues fans who have long lamented the lack of photographs of early bluesmen, will rejoice that McConnell has used her talent to preserve the likenesses of bluesmen in these three-dimensional sculptures, each of which captures the minutest details of a performer’s face. Included are the images of Bo Diddley, Bobby Rush, Charlie Musselwhite, David “Honeyboy” Edwards, Pinetop Perkins, Robert Lockwood, Little Milton, Bobby Blue Bland, Koko Taylor, and a host of others. The reception is free and open to the public. For more information on the exhibit and other events during the Year of Delta Heritage, call the Delta Center for Culture and Learning at (662) 846-4311. (Press Release from the InterContinental/Chicago) The plethora of blues clubs in Chicago presents a quandary: with so many to choose from, how do you know which ones are worth your time and money? Luckily, the InterContinental in Chicago has done the legwork for you, with its Blues Chicago package. 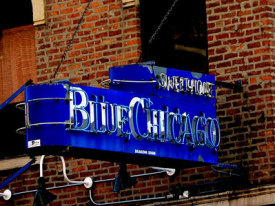 Rates start at $221 per night, per couple, and include VIP passes to the legendary Blue Chicago Club, with an opportunity to meet the band; a commemorative autographed CD from the Club; and a tour of Chess Recording Studio, where artists like Muddy Waters and Sonny Boy Williamson have recorded music. Note: A two-night minimum stay is required. Hey, hey he's...an advice columnist? 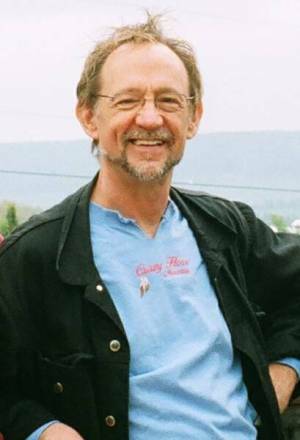 Peter Tork, former member of the Monkees and long time heartthrob of women "of a certain age" hasn't stopped rocking - he's still got a blues band on the road and does Monkee-related appearances to the delight of old and new fans, but he's also taking his life experience and passing it on to readers who ask his advice on everything from boy trouble to boy bands. Along with Davy Jones, Micky Dolenz and Michael Nesmith, as the TV and pop music darlings the Monkees, Peter Tork rocketed to world wide stardom in the 1960s and has periodically toured and worked with his former bandmates since then, including several very popular reunion tours and a TV special. As part of the motley and irresistible crew of writers at http://www.thedailypanic.com, Peter is the newly-minted advice columnist and author of "Ask Peter Tork". You can write to him yourself at askpetertork@thedailypanic.com. Think of it as having your own Monkee Uncle. To celebrate Delmark and Bob Koester's 55th year in the music business, Delmark is throwing a special all-star tribute concert with a who's who of Chicago Blues on Friday, March 7th at Buddy Guy's Legends. Delmark artists and friends Dave Specter, Byther Smith, Jimmy Dawkins, Tail Dragger, Jimmy and Syl Johnson, Little Arthur Duncan, Shirley Johnson, The Big DooWopper, Zora Young, Aaron Moore, Lurrie Bell, Michael Coleman, Eddie Shaw, and many more special guests are scheduled to perform! This can't miss milestone tribute concert will also be videotaped for future broadcast on satellite television. Delmark is planning a commemorative CD compilation for their 55th Birthday. 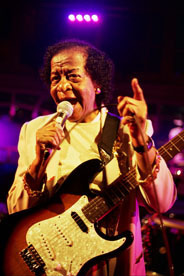 MUSIC MAKER ARTISTS TRAVELLING "DOWN-UNDER"
Music Maker Artists - Beverly "Guitar" Watkins, Dr. G.W. Burt, Albert White, Pura Fe Crescioni, Eddie Tigner, Tommy Brown, and Little Joe Burton will be traveling to Australia this March for the Byron Bay East Coast Blues and Roots Music Festival and the Southern Roots Festival in Tasmania. They will be sharing the stage with legends like Keith Urban, John Fogerty, Buddy Guy, John Hiatt, Ray Davies, Keb Mo, Michelle Shocked, and Sinead O'Connor. They will entertain audiences of 8,000 people! Tampa, Florida; Hollywood, Florida; Holmdel, New Jersey; Atlantic City, New Jersey; Toronto, Canada; Montreal, Canada; Noblesville, Indiana; Cleveland, Ohio; Uncasville, Connecticut; Boston, Massachusetts; and Wantagh, New York. BLUES DANCING -- A new dance sensation catching on fast! Modern "blues dancing", still mostly undefined, has been a growing phenomenon in Austin, Dallas, San Francisco and Seattle. Despite Memphis' historic connection to the blues, it's just now catching on there. For that thanks is due to a couple of swing dancers who, this time last year, started NewVo Blues Dance, a club of like-minded movers who get together to dance to Memphis' most famous resource. conference, many from out of state. 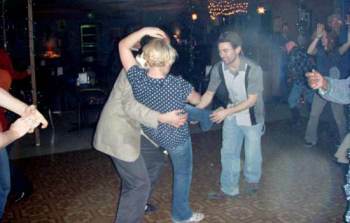 NewVo Blues Dance, has been started to teach and support blues dancing in the Mid-South. The focus will be on building a community of dancers, teachers, musicians and businesses within the community. Defining "blues dancing" is a regular challenge for NewVo Blues co-founder Sarah Beth Larson, 32, a technical writer by day. "It's an exchange of energy," she says, in a nutshell. "You're feeding off energy -- the energy of the musicians on the stage and your partner's energy. A good dance is when I can close my eyes and feel that emotional connectedness." A slow dance might have the sensual grace of a tango, while a faster dance resembles swing without the acrobatics. "There are actually a lot of different forms of movement in blues dancing, "Larson said. "It's not as rigid, which makes it easy to get started with." Blues dancers meet regularly on the first and third Thursdays at Neil's, where the Memphis Blues Society holds open jam sessions, free of charge. The dancers arrive around 9 p.m., eager to work up a sweat to whatever the rotating line up of guitarists, harmonica players and singers serve up. There are surprisingly as many men as women on the dance floor, and no one keeps the same partner for long. While most can swing to an uptempo tune, a slow blues song is more likely to get people out of their seats. They notch into each other, the weight shifting to their hips and legs. Experienced dancers can improvise off a guitar riff as if they had the notes memorized and the steps choreographed. "Blues is very liberating," said Mike Tinsley, 30, who works with computers. "For guys, especially, if you have the right attitude, go out there with a smile and confidence, then people will want to dance with you. For the novice, it might just be some stepping from side to side, but there is a technique to it. It's the one place where a computer geek with virtually no social skills can learn the moves and be able to dance with the most outrageously attractive women because they love to be asked to dance." The primary mission of NewVo Blues is to promote opportunities for people to dance to the live music that is so plentiful in Memphis. It also seeks to combine a love for blues music with interpretation and connection to the music through dancing. Blues dancing appeals to different types of dancers because of the opportunities for fusing it with moves from ballroom, salsa, swing, tango and even more styles of dance. The traditional blues dance is a forerunner of vintage swing dancing, already being done by groups in Memphis and other scenes around the country. "Dancers all over the country have been into blues dancing for a long time now. We think Memphis is ready to really take advantage of the national trend," says Candace Gustine, a partner in NewVo Blues. "Blues dancing is something that appeals to a variety of dancers, and even people who are used to appreciating the music from the sidelines," according to Sarah Beth Larson, the other half of the new venture. "Even people who never thought of themselves as dancers can look at other people bluesing and think, 'Hey, even I could do that!' because it relies so much on an appreciation for the music." 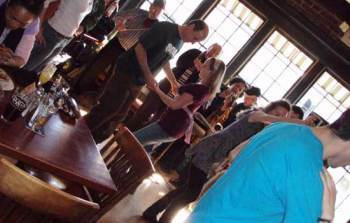 NewVo Blues will partner with local clubs and other businesses to create a schedule of blues dance lessons around town. They also plan to coordinate trips to regional blues events, like April's Juke Joint Festival in Clarksdale, MS, and national dance events, like Atlanta's ENTER THE BLUES and BluesShout in St. Louis. The group will appeal to dancers from established groups in Memphis, as well as non-dancers. Periodically they will bring in nationally-known instructors to infuse the local scene with variety and creativity in dance. "There are countless ways to incorporate other dances into blues, but the fun part is getting inventive with it," says Larson. "You can really make a song your own by bluesing to it; it's like putting your personal trademark on it." The group's website, www.NewVoBlues.com, will list lessons and events in Memphis and out of town. The name NewVo comes from a fusion of nouveau, the French term for "new", which is what blues dancing is to the community, and "V.O." the abbreviation used to indicate aged liquor ("very old"). NewVo itself incorporates the Southern style of phonetic spelling, giving it a friendly down-home feeling. "We want this group to be seen as approachable, since our vision is to bring together dancers of all types at some of the most fun places to dance around town, " says Gustine. If you would like more information about NewVo Blues Dance, visit their website at www.NewVoBlues.com after March 5th, or to schedule an interview with either Candace Gustine or Sarah Beth Larson, please call 901.336.9643 or email NewVoBlues@gmail.com. DESCRIBE MOST UNIQUE FESTIVAL AND GET IT PUBLISHED IN THE BLUES FESTIVAL GUIDE MAGAZINE! This is Michele Lundeen (aka The Queen of Steam), the Editor of the Blues Festival Guide magazine. We love all Blues festivals, from tiny, medium, large to humongous, but we thought it would be fun to share with our readers what makes any one of these festivals truly a standout (besides the fine artists of course). In 100 words or less we'd love for you to describe the coolest and/or most unique thing a festival has had to offer that you've attended or been an integral part of. CLICK HERE to email your responses right away. Please also include the festival name and location, and your full name and your location. Your submission may be used in the Blues Festival Guide 2008 magazine! The material Ana and Rudy are working on is so cutting edge it seems to be just what Eclecto Groove Records needs to crossover Ana into a commercial pop market. So dust off your dancing shoes and get ready to hit the club scene; the “Still Making History Remix” album is going to be a sensation for DJs all around and will have every young music lover on the dance floor all night long. Stay tuned for more information on the release of Ana Popovic’s collaboration with esteemed producer, Rudy "Mayru" Maya. Delta Groove Music and Eclecto Groove Records are bringing a new generation of great blues artists to the crossroads where the blues was born! The 3rd Annual Delta Groove Blues Revue will take place the night after the 2008 Blues Music Awards in Clarksdale, Mississippi. On Friday May 9th, at Clarksdale, Mississippi's Ground Zero, the historic and intimate blues club, owned by Morgan Freeman and Bill Luckett, Delta Groove is bringing you authentic blues from 2pm to 2am. The show, which will be hosted by Bill Wax (XM Radio) and a very special surprise celebrity, will be filmed and recorded for an upcoming TV special documenting the power of the blues from its birth in the nearby fields to the current generations making it thrive in the 21st century. For the lucky audience in this 270-person club, this will be blues heaven on earth and the rest of the world will be able to share in the magic later. For the last two years, The Delta Groove All-Star Blues Revue has been a smashing sensation! We are still receiving feedback as to the magnitude of the effect the shows had on those present. You really don’t want to miss out on your chance to experience the day long festival showcasing some of the best blues musicians on the scene today! The Bluebonnet Blues and Fine Arts Festival (March 28-30th) has announced updates to their line-up. For the complete schedule Click Here. Please note the addition of Nick Connolly to the Friday main stage line-up . Pianist and organist Nick Connolly has been working professionally since 1965. He has been based out of Boston, Los Angeles and Austin Texas for the past 25 years. He performs with many bands and solo, and for the Bluebonnet Blues Festival he'll be playing with Chris Holzhaus and Augie Meyers. Connolly's vocals have been compared with Mose Allison. He was nominated for a Grammy in 1989 for his work with Delbert McClinton. The Bluebonnet Blues and Fine Arts Festival takes place in Marble Falls, TX from March 28-30th. The event encompasses 7 venues and covers multiple blocks in downtown Marble Falls. Everything is bigger in Texas and this is the blues festival that proves it. Last month Delta Groove Music completed work on two amazing projects scheduled for release later this year by The Mannish Boys and Bobby Jones. A total of thirty songs were captured on the magic of analog tape in just five days at SlideAway Music Studios tucked away in the rolling hillside of Shadow Hills, CA. The sessions were produced by Randy Chortkoff and Jeff Scott Fleenor and engineered by acclaimed producer and engineer David Z. with additional engineering assistance by Chuck Kavooras. Mannish Boys’ alumni Finis Tasby, Johnny Dyer, Kid Ramos, Frank Goldwasser, Randy Chortkoff, Tom Leavey and Richard Innes made up the core of the band along with newest member and vocalist Bobby Jones. Also making return appearances from earlier Mannish Boys efforts were guitarist Kirk “Eli” Fletcher and bassist Ronnie James Weber with additional guests rounding out the sessions including Little Sammy Davis, Fred Scribner, Phillip Walker, Junior Watson, Al Blake, Lynwood Slim and Fred Kaplan. Kenny Wayne Shpherd and Elvin Bishop will headline BLUES ON THE FOX, June 13th and 14th in downtown Aurora, IL. Heavenly scents and divine tastes will invade Cañon City, Colorado during the inaugural Royal Gorge Holy Smoke Barbeque Showdown on the former Abbey football field. Appropriately named for its location at the former monastery, the Holy Smoke competition is sanctioned by the Kansas City Barbeque Society and will abide by its rules. The event is a fundraiser for the Belvedere Blues Foundation, known formally as the Fremont Community Nonprofit Center Foundation. Scheduled June 27 and 28,2008 the event will feature 30 to 40 teams competing for cash prizes and bragging rights. A variety of barbeque and beer will be available, and music will keep the event hopping throughout the weekend. 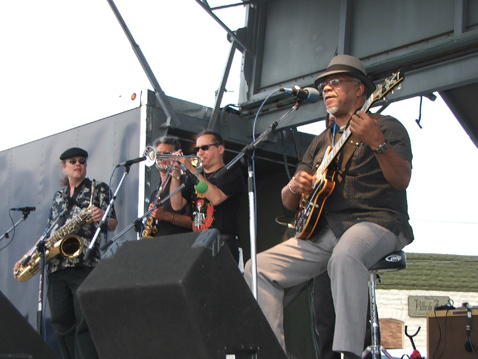 The City of Chicago has announced a landmark celebration for the 25th Annual Chicago Blues Festival, June 5-8, 2008. Sweet Home Chicago has never been better, as the Chicago Blues Festival takes over Grant Park June 5-8, 2008. The largest free admission Blues festival in the world, the four-day festival offers the best in national, international and local Blues entertainment on six stages with more than 70 performances, preceded by a month of Blues activities (Blues Season) throughout Chicago. In commemoration of the 25th Annual event, the festival not only will feature a quarter of a century of the blues festival highlights but also celebrate the centennials of Louis Jordan, Tommy McLennan, and Blind John Davis. Annouced performancer include Buckwheat Zydeco,Lil' Ed and the Blues Imperials,Koko Taylor,Eddy "the Chief" Clearwater, Pinetop Perkins, Honeyboy Edwards, James Cotton, Johnny Winter (Winter hasn't performed at the event since the very first Chicago Blues Festival), Lurrie Bell, and the king himself, B.B. King. The Government of Canada is lending support to the Saskatoon Blues Society. The funding of $6,000 will help the Saskatoon Blues Society support, promote, and celebrate blues music through its annual festival in Saskatoon. "The Government of Canada is pleased to announce funding for the 2008 Saskatoon Blues Festival under the new Building Communities Through Arts and Heritage program, " said Minister Verner. "Events like this one bring together people of all ages and backgrounds and contribute to building strong communities, " said Ms. Yelich. "I am proud that our Government has taken decisive steps to strengthen our shared sense of heritage." "The assistance of Canadian Heritage is greatly appreciated, as the funding contributes to the success of the Saskatoon Blues Festival in providing a high quality, diverse, and accessible production. Thank you Canada for helping to melt down the winter blues, " said Jeff Montgomery, Committee Chair of the Saskatoon Blues Festival. In addition to primarily showcasing local blues musicians, the Saskatoon Blues Festival invites artists from the region, across Canada, and elsewhere. This festival gives blues musicians the opportunity to showcase their talent and gives residents of Saskatoon an opportunity to experience and gain an appreciation for the blues genre. The festival consists of presentations and activities for all ages. The Saskatoon Blues Society is made up entirely of volunteers, and the Saskatoon Blues Festival is organized and presented by approximately 100 volunteers. This year's festival runs from February 28 to March 2, 2008. 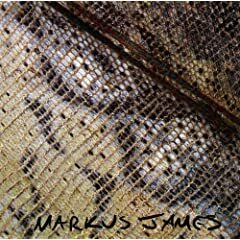 MARCUS JAMES:previews his new CD "Snakeskin Violin"
Like many blues players, Marcus James has gone to Mali in West Africa to find the roots of American Blues Music. For his new CD he brought the blues to Mali, and then brought Mali and then brought Mali back to the blues. Join Elwood Blues as he talks with Marcus James and plays a few tracks form his newest record SNAKESKIN VIOLIN. This week on the House of Blues Radio Hour.